Dalbeattie Museum, opened in 1993, is located at 81 High Street, Dalbeattie, DG5 4BT. The museum opens on March 31st until the end of October and the opening hours are Monday to Saturday - 11am until 4pm. It will be open over the Easter Weekend including the Sunday. Admission is FREE (all children must be accompanied by an adult). For further information and a list of events visit the museum website. 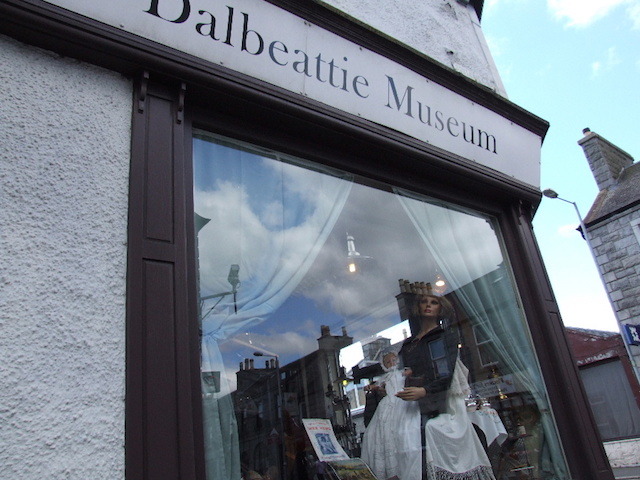 For more information about the Dalbeattie Museum Trust, click here. In 2008, Dalbeattie Museum published a book Dalbeattie The Auld Scots Hame priced £8.00. The book sold very well, in fact better than we expected and copies were sent all over the world. It depicts cuttings from the old Dalbeattie Observer written By Mr Thomson from Dalbeattie. He was the son of Thomson the clogger. In the book are his reminiscences after he left to work in England in the 1930s. This was put into book form by T. Henderson, Chairman of the Museum. There are still some copies available and these would make an ideal Stocking filler for relatives and friends. If you would like a copy, send a cheque payable to Dalbeattie Museum Trust Ltd to cover the cost of the book plus postage to Dalbeattie Museum Trust, Southwick Road, Dalbeattie and your copy will be sent to you. We have also now got a lapel badge depicting our Hour Glass logo and Keyrings with the same logo mounted on a gold Background which have proved to be very popular. We have on display a very large Tapestry bed spread depicting our Granite quarry connection with Westerly Quarry in America. This was gifted by Mrs R. Charnley from Dalbeattie. Our small exhibition showing just how important our local harbour was to the town at its inception, has been well attended. This reflects the efforts of Dalbeattie Community Initiative in clearing a path into our harbour, and in the coming year it will be another place to visit on our Sculpture trail. We have something unique here due to the fact we are five miles inland from the sea. Extensive alterations created a greatly enlarged and enhanced Dalbeattie Museum which reopened on Easter Weekend 2009. Since closing at the end of the season in September 2008, the Museum acquired the adjacent property (formerly Hewats Estate Agents), thanks to the generous bequest of the late Jack Benson and was finally been able to spread itself a bit more. With a doorway knocked through from the 'old' museum to the 'new' museum, Tommy Henderson and members of Dalbeattie Museum Trust created an old fashioned 'shop' at the front of the Museum, plus a kitchen circa.the 1920s, and a small Viewing Room to look at movies of old Dalbeattie. This has meant more space to develop the existing premises as well, which now also contain a period cycle workshop, the Titanic exhibition, and the Rural room.Upstairs there is now some space to spread out the original exhibits to better effect. 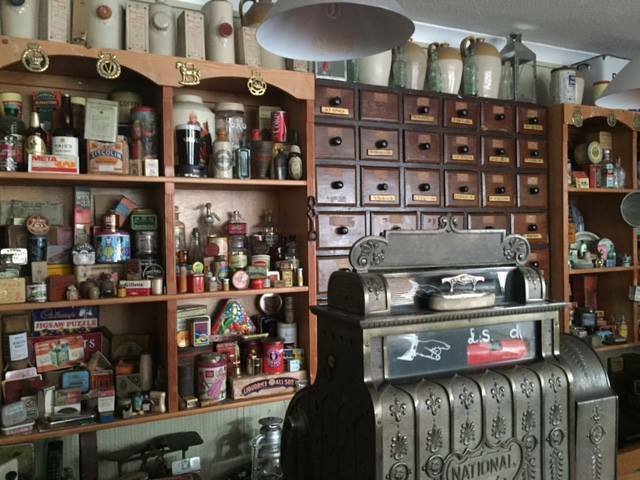 The Museum is an excellent record of Dalbeattie in Victorian and early 20th Century times, right up to the 50s and 60s.You can spend a truly memorable hour or two reminiscing and wandering down memory lane, and for the younger visitors many of the exhibits are 'hands on' (under adult supervision). In 2010, the Museum was gifted Old School Registers dating back to the 1900's. These books name all the pupils that attended the school and where they lived in Dalbeattie and area. Another two registers gives us the names of all the pupils that were evacuated to the town in the 1940's and who they stayed with and it also gives the name of the school they left to come to the town. These registers will be of great help for anyone whose parents came to Dalbeattie during the 2nd world war. A War Bunker has been constructed by two of our members under the stairwell in the Museum. We hope it will convey just what it was like during those dark days of war. A new show case in the main gallery contains several Christening Gowns dating back to the early 1800's. These items will compliment the large Victorian Perambulator which has been lovingly restored by members of the museum. This large coach built pram was used by the local laird to push his children around his estate. Local Transport in the form of Die Cast Toy Lorries and Cars from a private collection belonging to our youngest members Fraser and Graeme Henderson. 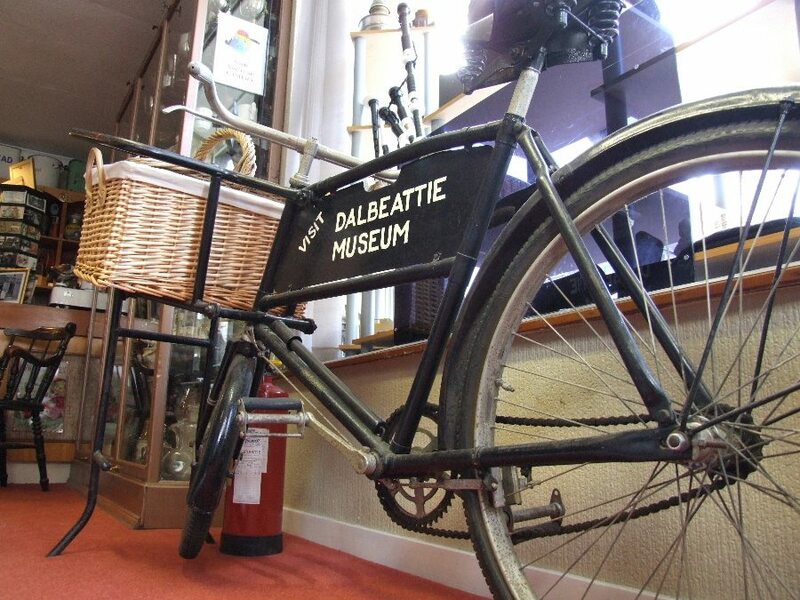 For more information about Dalbeattie Museum visit their website. Dalbeattie Museum's voluntary members were awarded this highly prestigious award on the June 2nd, 2009 as a recognition of all their hard work over the last 16 years. Tommy Henderson said on receiving the news of the award: "It is really wonderful that the museum and the people of Dalbeattie have been recognised for all the hard work that has gone in over the years" the award will be presented by the Lord Lieutenant of Stewartry on a later date and four members of the museum trust have been invited to the Queen’s garden party at Holyrood House in Edinburgh. 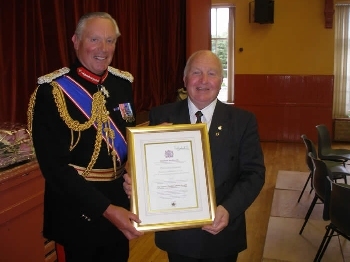 On Tuesday the July 7th, 2009 in the Town Hall, Dalbeattie Museum was officially presented with their Queen’s Award Certificate and Commemorative Crystal Ware for Voluntary Service, from Lt. Col. Sir Malcolm Ross, GCVO OBE. The Presentation Ceremony started off by guests being met by the Lieutenant's Piper, Miss Megan Morgan. The introductions were done by Mr. Derek Crichton, Area Manager for the Stewartry, followed by Mrs. Jean Farish who gave a small speech about how the Museum had received the award. Tommy Henderson, Chairman, received the certificate and Crystal Ware from Lt. Col. Sir Malcolm Ross, after which, he replied on behalf of the volunteers with a speech thanking everyone for this huge privilege bestowed on them. Shortly after Mr. Tommy Henderson gave a presentation on the history of the making of Dalbeattie Museum. After winning the Queens Award, the Museum received congratulation cards including one from former First Minister Mr Alex Salmond and that year, the museum welcomed a record 5,000 visitors. The comments in the visitors' book have congratulated us on the way the visitors have been treated in the Museum many of whom have come from all over the world including New Zealand, Canada, the USA, Holland and Norway.